I get the radio call the wild dogs, Lycaon pictus, are hunting a herd of Kudu at Londolozi. I set up the camera and the next second the herd of kudu comes thundering past my jeep. There are yearlings, sub adults and females, all within the range of this Super Predator. A mature Kudu bull breaks ranks with the herd and runs away from the fleeing herd. Surely four dogs with a combined weight of 100kg are not going for an adult Kudu bull that weighs 250kg. Stay with the herd I tell myself, stay with the herd. I am wrong, very wrong. Effectively, by isolating himself from the herd, he selects himself. Possibly he thinks his great size is his defense. There is no ways four small wild dogs will take him on. Like me he has made a terrible mistake. His mistake will cost him his life, my mistake will cost me a valuable, dramatic sequence of wild dogs pulling down a Kudu bull. For just seven minutes we lose the pursuing dogs and the fleeing Kudu bull. When we arrive on the scene, the Kudu bull is stone dead, not even breathing. With surgeon like precision the dogs open the carcass and then begin feeding in earnest. Not even an agitated herd of elephants will deter them. In the space of one hour, 4 wild dogs had reduced the Kudu bull by half. A rough estimate reveals 4 dogs have consumed 50kg of meat or ± 12kg per wild dog. Is this possible? 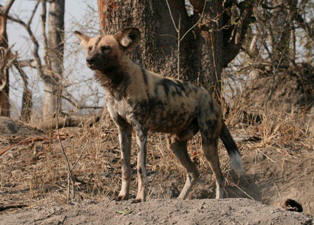 Is it possible that each wild dog has consumed almost half its own body weight in just one hour? How they have done this, remains a mystery to me, but their stomachs are bloated to the extreme. Not only are the wild dogs feeding themselves, but also 5 puppies back at the den. Bloated and sated, they return to the den and under a full moon, they disgorge meat to the puppies. However they don't disgorge all the meat immediately. Over a period of two hours, every one of 5 pups gets his fair share of disgorged meat. Within seconds of them leaving the kill, a sixteen year old female leopard who we know well, arrives and feeds ravenously. The hyenas arrive and by morning the bones are scattered far and wide and only a small patch of blood marks the spot where the kill occurred. With ruthless efficiency, the natural cycle is complete. Although the reference books say that wild dogs never return to their kills, two of the wild dogs return to the kill site and carry bones back to the pups. For thirteen weeks Londolozi rangers and guests have had the privilege of watching four adult dogs successfully raise five puppies. It has been a rare privilege. As a boy I was told that wild dogs were cruel and ruthless killers. We shot them on sight. Today I have nothing but admiration for this magnificent hunter and caring parent. Being a long distance runner and sprinter, they cannot afford to carry a heavy coat like the cats. A hot coat would overheat them when running. Especially on the lower body, the hair is very thin. I believe this makes them susceptible to cold freezing conditions in areas with harsh winters. Wild dogs have slender legs, a light frame, muscular body with large heart to body ratio. They have outstanding endurance and an excellent turn of speed. Their design is aerodynamically very efficient. Their slender legs however, will be less efficient on hard ground, rocky terrain and the hot sand dunes of the Kalahari. I believe these are limiting factors in their distribution. Because wild dogs spend so much time in close contact with each other, they are susceptible to disease. In the Masai Mara in Kenya, I began a film on wild dogs, only to watch the entire pack of 40 die of rabies. This they had contracted from the Masai domestic dogs. Apart from this, it is human beings that are their biggest danger. Their system of roaming across vast areas, sooner or later brings them into conflict with hostile human beings. I filmed a pack of 8 wild dogs dead around a carcass poisoned by a farmer. Ironically the wild dog is rated as the most successful hunter of all the predators. Their success rate when hunting is high, yet they remain the most endangered large predator on the African continent. Members of the pack are intensely loyal to each other, the ultimate team players. We could learn a lot from wild dogs. Londolozi is moving into a drought situation. It is at times like these that one sees animals and habitat under severe stress. The fit survive and the weak perish and the predators thrive. JV Big Cat Safaris have filmed a photographed some incredible predator prey scenes recently. Gavin Lautenbach watched "Mashabene Young Male" drown an adult Nyala in Shingalana Dam. This will change with the first rains, so book your safaris now.